Philippines - The Philippine Atmospheric Geophysical and Astronomical Services Administration spotted the new potential cyclone to enter the Philippine area of responsibility within the next 24 hours. The low pressure area was seen as of 4:00 AM at 940 kilometers east of Northern Mindanao. PAGASA said, the potential cyclone will enter the country and will be given a code-named “Henry” once it enters the Philippine Area of Responsibility and intensifies into storm. 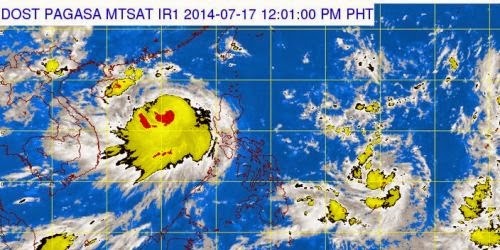 According to state weather bureau PAGASA, the Low Pressure Area (LPA) was estimated at 970 km East of Northern Mindanao. In addition to that, Typhoon Glenda is now outside the PAR and located at 480 km West of Dagupan City. Meanwhile, PAGASA, advised all residing in Metro Manila, Central Luzon, CALABARZON and the provinces of Mindoro, Palawan, La Union, Benguet and Pangasinan that will have occasional rains after typhoon Glenda leaved the Central Luzon with a death toll at 38 by NDRRMC. For more information about the new Potential Cyclone in the country, kindly bookmark this page and share to your joined social networking sites. Comments or suggestions about "After Bagyong Glenda, new Potential Cyclone to Enter PAR" is important to us, you may share it by using the comment box below.